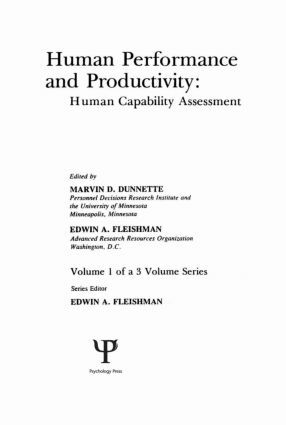 These volumes represent a concerted attempt to link what is known from human performance research to recognized national needs for improving productivity. The product of a National Science Foundation project directed by the series editor, the set features authoritative reviews by leading psychologists in the field. The volumes cover many areas of human performance not included in other books. Contents: E.A. Fleishman, Introduction. M.D. Dunnette, Critical Concepts in the Assessment of Human Capabilities. D.A. Bownas, N.G. Peterson, Skill and Task Structure and Performance Acquisition. F.A. Muckler, Evaluating Productivity. I.L. Goldstein, V.M. Buxton, Training and Human Performance. L.F. Schoenfeldt, Intra-individual Variability in Performance. B.M. Bass, Individual Capability, Team Performance, and Productivity. J.E. Hunter, F.L. Schmidt, Fitting People into Jobs: The Impact of Personnel Selection on National Productivity.